Hollybeary Creations : Surprise Birthday Blog Hop!! Today is a super special day, we're so glad you're joining us! 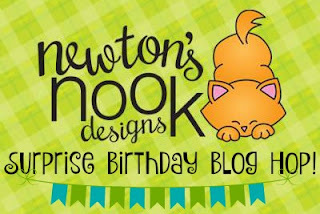 All of the Newton's Nook Designs DT members have gotten together to throw a surprise birthday blog hop for Jennifer, the owner, illustrator and all around wonderful person behind Newton's Nook! We are so honored to get to work with Jennifer, and we all just love her so much and wanted everyone to celebrate your birthday with you! We hope you have the happiest birthday ever! 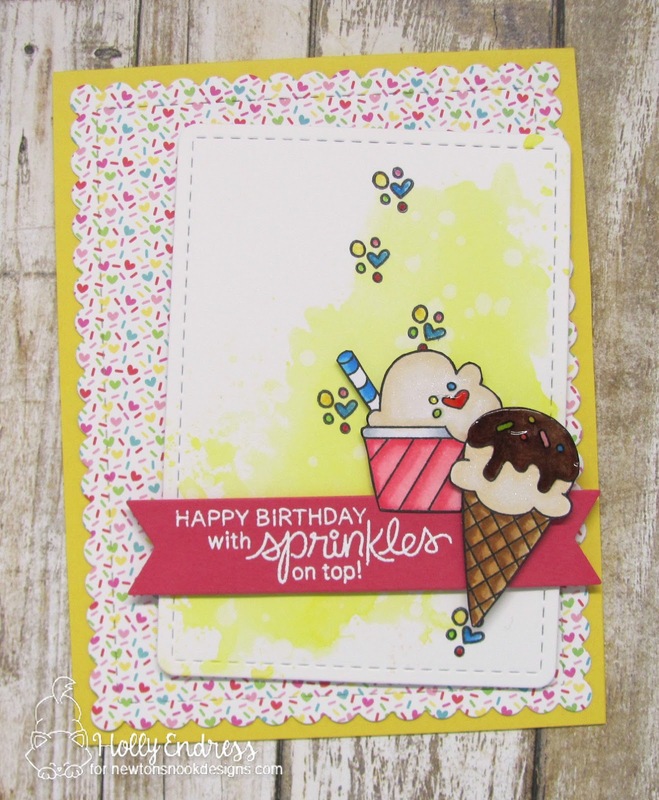 I created a cute Birthday card using the Adorable Summer Scoops stamp set. I die cut a piece of pattern paper using the scallop in the Frames and Flags Die set. I adhered that panel to a Yellow A2 size card base. Then I die cut a piece of watercolor paper using the same die set and added some Lemonade Distress Oxide ink. Once it was dry I added some of the sprinkles form the stamp set and colored them in with Distress Markers. I die cut a Pink Banner and then I heat embossed the sentiment using White embossing powder. I adhered it over the panel with some foam tape. I stamped the ice cream images onto some X-Press it blending cardstock and colored them in with Copics. I fussy cut them out and adhered them to the banner. I added some Clear Spectrum Noir Sparkle pen to the ice cream and some Clear Nuvo drops to the sprinkles and topping. Would you like to win a $25 gift certificate to the NND store? You could be the ONE lucky winner! Comment on the NND blog and Design Team blogs (see list below) with a birthday message for Jennifer! The winner will be chosen at random from the collective reveal posts. Make sure to check out each of their blogs and comment for your chance to win. You will not know which blog has been chosen so the more you comment on the better your chances are of winning! You have until Sunday, February 18th 9pm EST to comment -- winners will be announced on the blog post on Monday, February 19th. Such a happy and sweet card just like Jen 💕 Gorgeous coloring as always, Holly! Delish, such a sweet card! What a sweet card. :) I love how you used the glossy accent on the ice cream...and the yellow background is lovely! Darling card! Makes me think I should head to the ice cream parlor this afternoon to celebrate! Happy Birthday to Jennifer! Oooh, this card makes me want ice cream! So cute! Happy birthday, Jennifer! Happy birthday Jen. Hope Newton spoils you!!!! 💞 Such a sweet card!!! I wish you a yummy birthday party, Jennifer ! This is a beautiful card, but now I feel like having an ice-cream !!! Super delicious birthday card, I nearly started licking the screen! Such a yummy birthday card! I LOVE the way that chocolate icing looks on the ice cream cone! So much fun! Happy Birthday Jennifer too! What a delicious card! 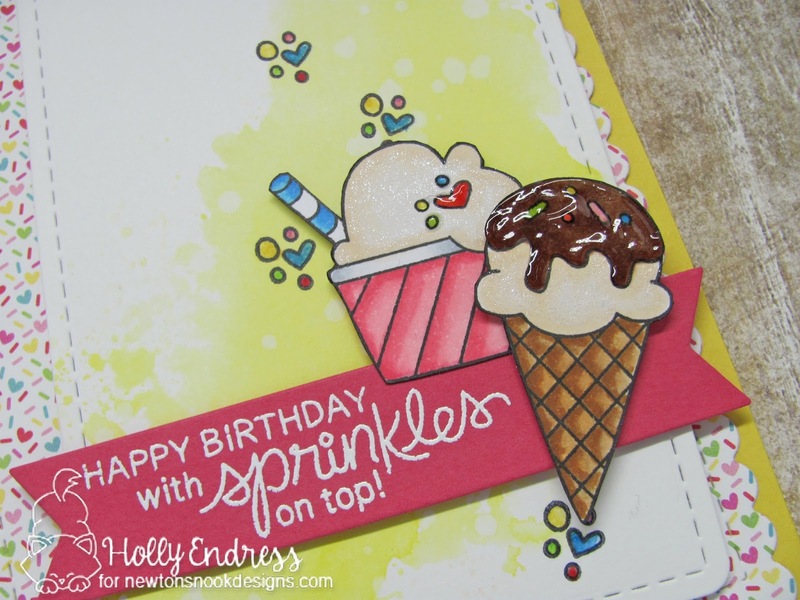 Love the sweet colorful palette and the sparkle pen and Nuevo drops really yummy up the ice cream! Have a wonderfully sweet birthday Jennifer! Love Love LOVE this card! So very Yummy. Love the ice cream accents!!! Happy Birthday Jennifer! Ooooh, that fudge looks so yummy delicious! Yum! What an awesomely delicious looking card! Wishing Jen much happiness on her special day! She's one of the sweetest people around! Happy Birthday, Jennifer! May this be your very best year yet! Holly, that chocolate on the cone looks AMAZING. Great card!!! Oh yum! What a great to celebrate, especially with the glossy hot fudge! Super cute card. Happy birthday to Jen! Mijn Engels is niet zo goed, dus gewoon maar in het Nederlands. Wat een leuke kaart en toepasselijke tekst. Sweet card design. Happy Birthday to Jennifer! Super sweet card, haha! Happy birthday Jennifer! Surprise Jennifer!!! I hope you have a wonderful day filled with lots of cake and ice cream. Ooooh, spectacular card! I love all the little details and that background paper! That’s a great card ! Hello Holly! Thank you so much for hopping along for my birthday! Such a lovely surprise! Your card is so pretty and yummy! I love the colors! So sweet. Love how you used the Nuvo on the toppings.